So you've been doing this power trio thing for eons now. You've made a ton of money. You have houses all over, cars and boats, even a couple of airplanes. You've won awards, you play to sold-out arenas. But it all feels so... so empty. If only you had your own guitar, one with your name on it. That would make everything feel worth it. 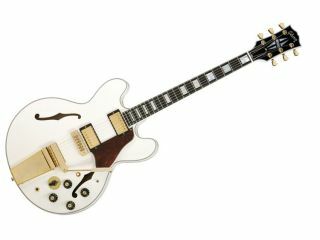 Gibson has answered Alex Lifeson's dream with the new Alex Lifeson Memphis ES-355 semi-hollow electric guitar, a remarkable re-creation of the original 1976 Gibson ES-355 that has been such a part of Rush's breathtaking sonic texture. It's Gibson's heartfelt tribute to a true modern master, and to the guitar he used to expand the definition of popular music. The guitar features a maple body, three-piece maple neck, 22-fret ebony fingerboard, pearl block inlays, and a scale length of 24-3/4 inches. Other features include Grover keystone tuners, an adjustable wide-travel Tune-O-Matic Bridge, Maestro Long vibrola tailpiece, a magnificent Alpine White finish, and gold hardware. It would be the consummate prog rock machine even if it weren't the chosen axe of the Rush guitarist, but because it is, you know it's got the goods. The Vibrola is one of the least wood-invasive tremolo options, keeping the belly of this archtop guitar remarkably pristine and preserving its natural resonance. The pickups are faithful Alnico II replicas of 1950s PAF humbuckers. Want to keep the spirit of radio alive? Then check out the Alex Lifeson Memphis ES-355. It's available 3 March, 2008. U.S. list price is $5,645.00. Hey - maybe it's cheaper in Canada.